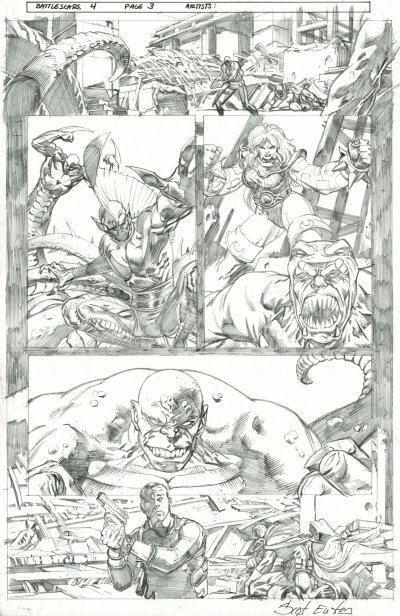 This pencils-only page is from the Battle Scars miniseries, just before my poor Serpent Society gets their butts kicked by Deadpool. They're suddenly getting a lot of use, but that use is sadly as cannon fodder. Still... Scot Eaton has drawn them both here and in the short Captain America arc done by Robert Kirkman, so when I saw one of his pages come up I jumped at it. It's a beautifully done page piece; his Anaconda and his Bushmaster are both lovely, for all they're slightly horrifying to boot. I fear my scanning job does not do the page justice - there's some wonderful detail in there. Snakes on a page: panel 2 is Bushmaster and Death Adder (the second one, not the original), panel 3 is Anaconda and Cottonmouth, and panel 4 is the Rattler. The two gentlemen in panels 1 and 5 are non-serpents, Marcus Johnson and Taskmaster.